The last thing there is with ease is craziness in this world. Here in the house of my grandparents where only my mom and dad now live it is dark, far darker than any other place I’ve ever been. That includes both sets of coastal mountain regions where I’ve been lucky enough to stay, over on the upper half of the west coast. Winter comes darker here in this pine-shrouded place mere miles from Ma Atlantic, in a way that’s way darker than anywhere else in my world. It is, this trip, a darkness of peace. So too this wild shining full moon: this bolt of truth-light lit up around the seeds that fell under winter-solstice’s new moon. Wild-eyed, moony vision, passions elemental in precision, lifeforce stirrings in pine-wind and starlight. Crazyyy. I used to call such potency “Mad-Poet Vision”. Nods to the tribe who hold the line of such teachings: my name or words for this derive from Allen Ginsburg’s studies of poet-ecologist Gary Snyder, who brought the teachings back from the monks in Japan. It is, condensed, what Ginsburg taught eventually as First Thought, Best Thought. To infiltrate the yak yak of the linear, egoic (or “male” animus mind), we allow the wild stirrings, the deeper impressionistic vibes that are psyche’s messengers to have their way. We have been programmed, in part from societal conditioning, to believe these are two different energies and that the one that is personally predominant is such according to your gender. In truth they are a continuum of single energy manifested as receptive or active depending on your state of consciousness. Every man is intuitive and receptive and every woman is thought-driven and purposeful, or so do we each have these capacities. One of the reasons women repress their strength or natural association with the realm of the feminine godhead (and therefor with the realm of the collective unconscious) is because we in Western society esteem a male God. The feminine, however, was at one time divined among many other aspects through menstrual mysteries. During the 14th and 15th centuries 9 million women burnt at the stake because of a document known as the malleus malefic arum which associated menstrual mysteries with being a witch. (see Shuttle and Redgrove’s (2005) The Wise Wound for more info.) 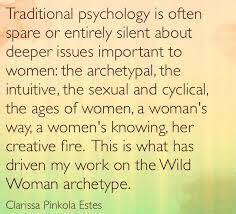 Thus inherent feminine wisdom had to be buried deep within the collective psyche, so that it is demonized or repressed and therefor shamed to the extent that rhythmic knowledge of one’s own psyche either as a female, or in regards to anima or feminine instincts, became associated with Satanism! It makes sense that 50’s gnosis would seek Eastern tradition for enlightenment, in that it was an overt response to the subversive tactics of the US Government during the McCarthy era, a time which saw people like Ginsburg and Leroi Jones (who became later known as Amiri Baraka) on trial for obscenity in their poetry. To quote a line of diPrima’s Rant, THE ONLY WAR THAT MATTERS IS THE WAR AGAINST THE IMAGINATION/ALL OTHER WARS ARE SUBSUMED IN IT (sic). To keep a people anesthetized on the illusion of Descartes self-vs other (embodied hate projected outwards) is the best way to keep them from opening the door to explore that our complexes begin, and can be transformed, from within. Eastern tradition introduced these 50’s rebel poets to the concept of non-dualism. So it is that first thought, best thought was born. Jack Kerouac actually took this concept and re-visioned what the modern novel could be–allowing for a trance-like, ecstatic spiral stream of consciousness to penetrate the tops layers of personality into the more free-associative realms of the deeper psyche. This is first thought, best thought: to follow the flow of the psyche in image, sensation, words, sounds, and to not resist what it arrives with or where it leads. To especially have no plan, but, as in the case of the writer, to be a channel for and follow the words. It is, throughout this act, how the artist speaks for the society by wheeling deeper and deeper into the collective unconsciousness and bringing out more and more to the host of light, or animus/ego-consciousness. I learned almost all of this information in books, long before I went to an Institution to study it. In fact, I had to skip school this past weekend out of reverence for the holy Poetry first thought best thought mad-eyed seeing in the dark vision. Despite my school’s worldly attempt to foster an environment that esteems Hillman’s non-literalization of the image, the final point is if you study this stuff too much instead of trying to live it–to actively dance the day with the doors of the psyche open and free–you deaden the archetypal mind. You Kill the Soul. So it is, this moon brings me to mind of the celebration of the Tribe of the Wild-Eyed. Those of us out there being it. Surrendering, again and again, all ideas in favor of the WILD, in favor of the psyche, the inner Nature, the Soul. May the outward full moon light, symbol of consciousness and focus, of male-orientation (the full moon reflects the light of the sun!) which shine-throttled through your personal dark all weekend long and likely stirred the wildinnereyes! Guide you inward and through doing so, help you re-relate. As always my prayers are that you re-relate in gentleness and love. May this moon light be ecstatic vision, may your trust in it be as strong as my reverent love for it. May it guide you ever home. If there’s anything to learn from diPrima and her tribe, it is that the Wild Eyed Vision, the embodiment of psyche and soul, the interchanging dance of male/female within, can happen no matter who you are. But let it happen. That’s the work. It takes practice to return. Again, again, again. Previous Post Women’s Mysteries: Winter Solstice and the Dark Moon. Hope. Next Post New Moon: Imbolc-tide on the earth path & in Laguna Canyon! thank you Andrea! Happy Imbolc!